So the National Zoo is losing it's baby panda today. Tai Shan has been at The Smithsonian Zoo for 4 years. He was only supposed to be on loan from China for 2 years, but his stay was postponed. 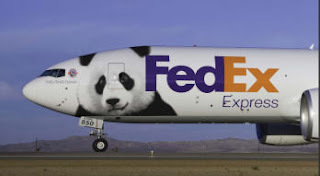 And today he will climb aboard a FedEx plane and fly to China. Which is pretty sad, pandas are a major attraction. There are only 13 pandas living in 4 zoos in the US right now. And only 1,600 living in the wild in China. Wow, I did not realize how endangered they are until just now! How sad. They are adorable too! !